This story first appeared in the July 2015 issue of All About Beer Magazine. Click here to subscribe. Our obsession with black beers is undeniable. Porter and stout are stalwarts, and newly cobbled styles, such as black IPA and saison, more trendy. But the eldest and most anachronistic of them all is German schwarzbier (black beer), a vestige from the cradle of European brewing and perhaps the longest-running beer style. The style has attracted long-overdue attention in recent years. The most convincing evidence of black beers of millennia past comes from the 9th century B.C. in Southwest Germany. An archaeological dig near Kulmbach in Franconia, Northern Bavaria, unearthed an Iron Age Celtic amphora containing the charred remnants of wheat, a raw material of prehistoric beer. This primeval discovery is the oldest evidence of brewing in Central Europe, and since the beer was black and brewed in Kulmbach, we might deduce that it is the ancient ancestor to schwarzbier, the “Lucy” of European beer. The region where Germany, Bohemia and Austria converge fostered several modern beer styles (Munich dunkel and helles, pilsner, rauchbier, schwarzbier and Vienna lagerbier), but, more importantly, was innovative on a grander scale. The embrace of hops, technical bottom-fermentation refinement and the development of distinct, utilitarian continental malts over time were significant developments. Prior to that, many beers were quite similar, composed of coarse malt and raw grains, top-fermented, smoky, murky and undoubtedly with a wild influence. Schwarzbier is a survivor of that medieval brewing scene and largely is brewed in Kulmbach and the former East German states of Thuringia and Saxony. Kulmbach came of age as a brewing center some 800 years ago. A charter letter penned by the bishop of Bamberg in 1174 references Kulmbach’s brewery. Further documentation comes from a manuscript describing the brewery of the local Augustine monks in 1349. These were top-fermented brews since bottom-fermentation would not become common until at least a century later. Another German black beer of the era was Braunschweiger mumme. Mumme was strong, sweet, heavily hopped and widely exported. Brewed since at least the 14th century, it became one of the most favored beers in Europe during the 16th and 17th centuries. Mumme was also brewed in Thuringia. Plain porter has also been brewed off and on in Germany, and Baltic porter is still made in Eastern Europe. Was schwarzbier influenced by mumme, or is the Kulmbacher style just a coincidental type, given contemporary ingredients and methods? 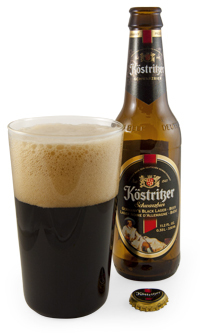 More likely, Kulmbach’s brewers were equally influenced by those of Munich, who also made dark beers. At some point, Kulmbacher schwarzbier and Munich dunkel diverged stylistically, the former favoring roasted malts and the latter Munich-style malts. It might also be surmised that neighboring Bamberger rauchbier and Kulmbacher schwarzbier were historically similar, both using smoke-cured malt. Bamberg brewers abandoned the roasted malts, but retained the old method of curing malt over beech wood. Schwarzbier is certainly a “black” beer relative to other familiar lager styles, but falls far short of the dark color that we associate with stout or porter. Not opaque, schwarzbier casts a bright mahogany-black color. The roasted character is meant to complement rather than dominate, giving both hops and base malt an opportunity at expression. Of course, it is the roasty component that makes schwarzbier unique. The barley used is malted and often dehusked, mellowing the contribution somewhat and offering some depth and finesse that roasted, unmalted barley cannot. Pilsner and Munich malts make up the majority of the grain bill. Classic German schwarzbier is medium-bodied, and pilsner malt helps keep the mouthfeel and residual sweetness under control, while the Munich malt offers up the toasted, malty flavors and aromas that we expect from dark German lagerbier. Hops are a bit more pronounced than one would find in a Munich-derived brew, common in Northern Bavaria, with one brewer going so far as to call itself the “black pilsner.” The dosage is evident, with a bit more background bitterness, but an especially firm blast in the aroma. As always, German noble varieties are requisite, adding to that distinguished German profile. The bottom-fermented, fully lagered smoothness is always a part of the picture, and gravity falls between 4.8% and 5.8%. 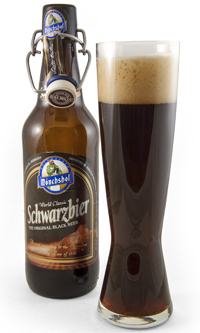 Schwarzbier has been on the radar of beer aficionados for decades now, but has enjoyed more popularity quite recently. Several authentic German brands are available, and Americans have also taken a shot in recent years. Those from America may have more of a roasted flavor than the German versions, but generally follow the original template. Tasting Notes: Brewed in a former East German town in Thuringia, on the same site since 1543. It pours a deep brown color with a sturdy head. The aroma is rounded with notes of toasted malt and toffee. Medium-bodied and creamy, with a flavor that is a beautifully complex blend of Munich malt, cocoa, vanilla and some hop bitterness. The roasted edge is mellow and humble, drinking like a Munich dunkel with a blackened accent. The finish is sweetish, the malty flavors lingering well into the next sip. 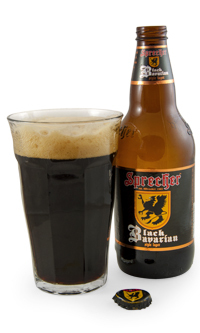 Tasting Notes: The Sprecher Brewing Co. is one of the oldest microbreweries in the Midwest, and its dedication to brewing traditional German beer styles is legendary. Ebony-black and nearly opaque, with a billowing rocky brown head. The nose is decidedly roasty and features a fresh waft of American and German noble hops and malt. Somewhat full in body. The flavor is earthy, with coffee, dark cocoa and caramel notes, followed by some gritty black patent character. Perfect for hearty Midwestern fare. Tasting Notes: Now in its 22nd year, Uinta makes a vast range of brews, but has always been as adept at making low-gravity, flavorful beers as anyone. At session strength of 4%, Baba is full testament to Uinta’s skills. As black as stout, it is foamy and lacy. The roasty aroma dominates, but there is enough malt and fresh hops there to add complexity. 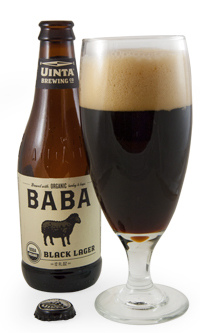 Very light on the palate, Baba offers up the usual flavors of charred grain, toasted, bready malt, a bit of sweetness and faint licorice found in black beers. Uinta is not shy about dosing this beer with hops. The finish is light and quenching, suitable for warm or cold weather. K. Florian Klemp is an award-winning homebrewer who thinks there is no more sublime marriage than that of art and science. First of all, thank you for such an informative article on schwarzbier. However, I have a question about Braunschweiger Mumme mentioned in the article. It states that Mumme was a heavily hopped beer. As much as I did my researches on it few days ago I found that actually Mumme wasn’t hopped at all. For example, Michael Jackson in his book “The world guide to beer” writes that “German brewer Christian Mumme produced a very high gravity, non-hopped beer to be taken by sailors on long voyages” (page 38).Also there is a recipe posted on the internet that doesn’t mention any hops either. Only herbs to replace hops I guess? It would be great if you could share some more information/references on B. Mumme.